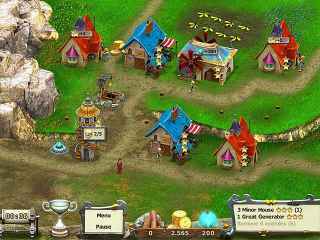 Free Download Age of Adventure: Playing the Hero Game or Get Full Unlimited Game Version! Travel back in time to an age of heroes in this fun time management romp! In order to get advantaged of playing Age of Adventure: Playing the Hero full unlimiteg game version you must register the game. Travel back in time to an age of not only chivalry and heroes, but also deceit and no-good, dirty backstabbers in this deliriously fun time management romp! Capturing a traitor, restoring a kingdom and falling in love might sound like a tall order, but it's all in a day's work in the Age of Adventure: Playing the Hero! Restore the historic Bowmont Theater as the first act of your mad dash to bring cinematic excitement back to Movieville! Challenge your mind and be a hero! Embark on an exhilarating journey to save your brother from an evil sorcerer and his Army of Darkness! Help Angela and Jimmy save the town of Shipsburgh! Practice your poker face and beat the Grimaldi Syndicate to save your hometown! Guide your band from obscurity to the top of the charts in Epic Slots: Rock Hero! Spin the reels and earn fans!